Was lacking a certain amount of organization. I know, those of you that tend toward OCD just went into a seizure. Sorry about that. So to make the moving, finding, and storing of my small tools a little easier, I decided to build some quick cheap wooden toolboxes. I bought select grade pine and it was still less than $50 for materials, so these boxes ended up being around $12 apiece. These are the two I completed this weekend, one for miscellaneous pliers and screwdriver, and one for hammers, levels, chalk-lines, etc. 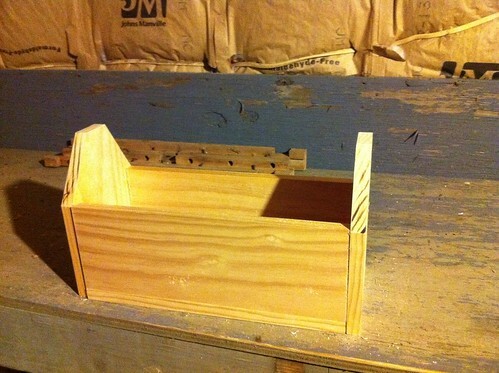 There are hundreds of different ways you can build a basic toolbox. As with most of my projects I choose to wing it instead of using a plan. These were meant to be quick, cheap, and fun, not a masterful piece of workmanship. 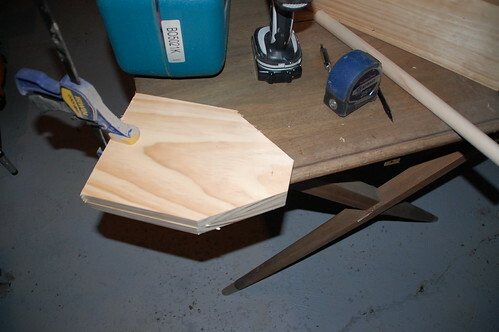 I started by cutting the 1×8 down for the ends and bottom on the miter saw, which I also used to slant the corners of the end pieces. Once all the pieces were cut I drilled the holes for the handle by clamping each set of ends together, marking one of them, and then predrilling through both too make sure the hole would be aligned. 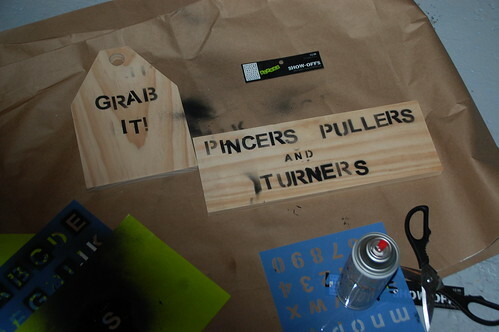 I was making these up on the fly and it turns out I get more clever the longer I inhale spraypaint fumes. I also debated for a good 15 seconds over “pinchers” vs “pincers”… I went with “pincers” specifically because it gives me the mental image of a lobster with a screwdriver in it’s claw. Absurd? Yes. But also amusing. And I used one nail through the dowel to secure the handle. Now I could have just used wood glue on the joints when I tacked it together, and with a few more nails it would have been good to go. However, apparently the wood glue didn’t make it with the rest of the tools in the move, I decided to use screws for added strength instead. I used four in each end, and four in the bottom of each side. 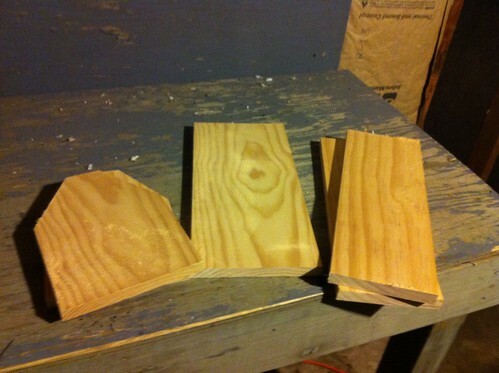 If I was going to be something made out of wood and screws, this would be it. 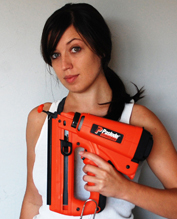 Sturdy, if not wholly attractive, and can carry around a whole lot of tools without taking itself too seriously. The final two boxes have yet to be assembled, but I’m thinking one is going to be for paint brushes and spackling knives, and the other will be for electrical equipment. And I have to say it feels great to have built something in the new place, finally. 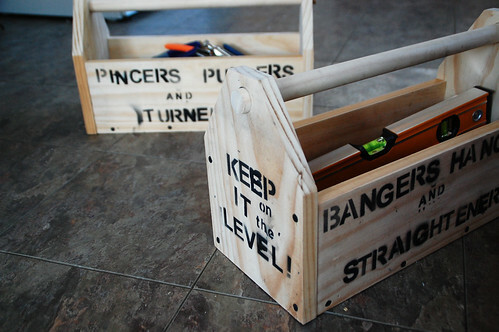 What do you think… would you treat your tools with more reverence, or are these toolboxes right up your alley? 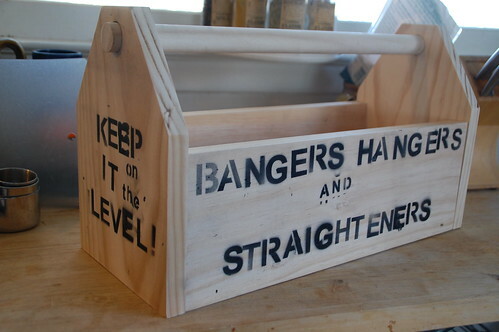 I made one of those in sixth grade technology/woodshop class! My mom still just uses it as a napkin holder decades later. Although yours obviously look a hundred times better than mine. I was scared of the belt sander and had someone else do that part for me and they screwed it up, so the sides are uneven. I’d rather have one of your cute labeled ones any day. Nice. We’re moving soon, and I want to put together a small shop when we do. These will be perfect – thanks! I like the way you’re organizing those tool boxes. 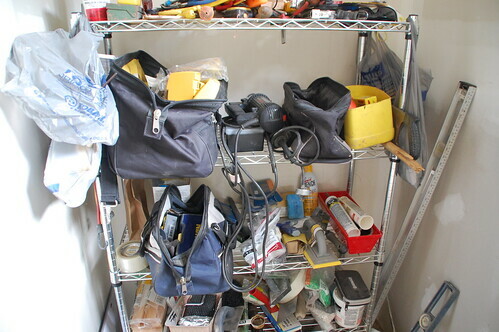 When we organized all of our tools in our garage makeover (this part yet to be blogged about LOL). We grouped everything together by category. Adhesives, electrical, plumbing, general handtools, safety, automotive, painting, etc. Then we put each category in bins or toolboxes and labeled them. Some bins have other smaller plastic containers inside (like electrical staples and wire nuts inside the electrical bin). The general handtools was the hardest but we found we had multiples of almost every one of them so we put one of each in a toolbox for on the go tool needs (throw it in the truck) and then with the spares we hung them on a peg board for quick and easy access. Ugh.. beaten to the punch again! These seem more fun and are certainly more attractive than other solutions, but I don’t think they are quite as practical. But I could see their practicality being much higher if I didn’t have to pull down each of them to get the 6 tools I need to, say, install a receptacle. Having an “electric” one would be faster. But that’s me. I am, above all, practical. They look lovely and I’m sure they relieved some of that pent-up must-create-something-now frustration I’m sure a homebuilder-turned-renter must experience. I’m with both of you, I actually have 2 canvas tool backs and a bucket with my “most used tools” that I tote around with me. What’s shocking (or not) is that I have four tool boxes worth of tools that just sit the bench. These are more for organization than for actually hauling around with me, I would guess. You never know how I’ll end up using something though! Oh! Perfect timing! I wanted to build one for my grandson for Christmas. Okay…he’s only 21 months…and his “tools” will be a bit bulky & probably neon colored, but it’s never too early to start him being handy! Thanks! It’s never too early to have a tool box! 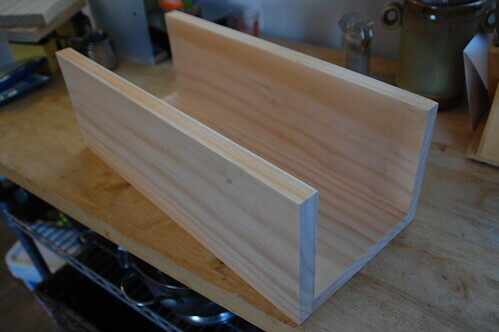 I think of myself as a cabinetmaker, not a carpenter, and I tend to do the bulk of my work in my shop. However, I also do a fair amount of work in the backyard or in other parts of the house. But even just working in the shop only, tool organization is helpful. I have long had a tool tote that holds my favorite hand tools. Whenever I work the first thing I do is grab that tote. 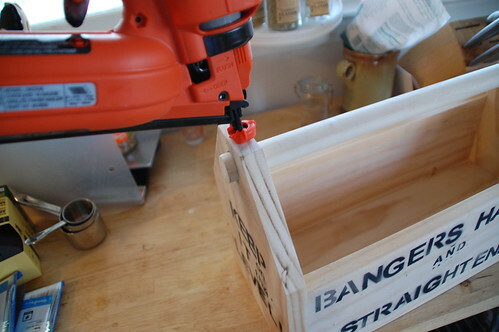 It does not hold all of my hand tools, but ninety percent of the time when I grab a hand tool, it comes out of that tote. The other thing I did was use a number of clear plastic containers for various tools. Two of them are organized with certain classifications of tools, and I find them enormously useful. The other thing I work hard at is consistently putting tools back where I found them. If you continually set down a tool the moment you’re finished with it, you will soon find yourself spending a lot of your time just looking for tools. That sort of thing is what caused me to organize my shop in the first place. I have made several “shadow boards”(not sure what you call them in USA) for my garage.Asimple piece of MDF or plywood fixed to a wall,paint it white.Now attch various tools using brackets etc. But paint around the shape of that tool.Now you can see immediatley which tool is not in its correct place when your finished using them. Love your blog! 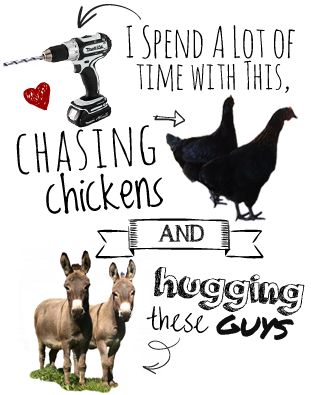 Found you from pinterest…hope u don’t mind but I repinned your toolboxes!!! These will make wonderful Easter Baskets this year! I really love these tool boxes. I see them working as really neat looking planters as well. I am currently rebuilding a mobile home that was given to me after my landlady’s son decided to sell the house (that I had rented for 24 years) out from under me. (This mobile home was so decrepit, that it should’ve been donated to the fire department, for a practice burn! LOL) Unfortunately, the mobile home does not have a garage which drives me insane, because I can’t organize my tools like I used to do! I used to be so organized that I could find any of my tools in the dark! My garage walls were lined with pegboard. Since my boyfriend could never remember where to put my tools back, I, too, outlined all my tools on the wall, making it much easier for him to clean up after himself and put my tools away WHERE THEY BELONGED!! Another thing I learned…was to spray paint ALL of my tools HOT PINK…because men don’t steal or even like to borrow…HOT PINK TOOLS!!! LOL! Plus, if I am ever working around anybody else and their tools, I can always tell at a glance, which ones are mine! Another thing I had in my old garage, were hanging bins all along one whole wall, that held hardware. I had any kind of nut, bolt, screw, nail, etc. imaginable hanging right where I could find it. (Now I have to dig thru boxes and it makes me crazzzzzy!) I bought all my nuts, bolts, screws, etc. at surplus stores, where I could buy them by the pound, rather than by the piece, as in many big box stores. Most of the time I could buy hardware for $1 a pound, rather than 3 pieces for $1. MUCHO cheaper and I usually had what I needed, when I needed it!! Good web site you have got here.. It’s hard to find good quality writing like yours these days. I really appreciate people like you! Take care!! May I simply just say what a comfort to discover a person that truly understands what they’re talking about over the internet. light and make it important. A lot more people need to check this out and understand this side of your story. I was surprised that you aren’t more popular because you definitely possess the gift. 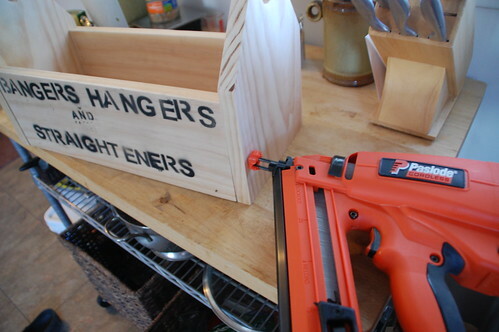 That’s such an easy toolbox to build but yet so effective. 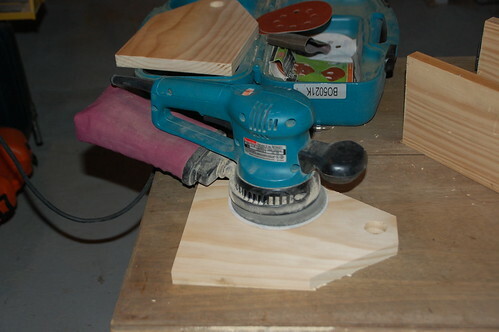 Shows you that woodworking doesn’t have to be hard. I love your title! Quite catchy! Loving the result, absolutely great! Sharing a little something to inspire as well, cheers! You are totally badass who I want to emulate. 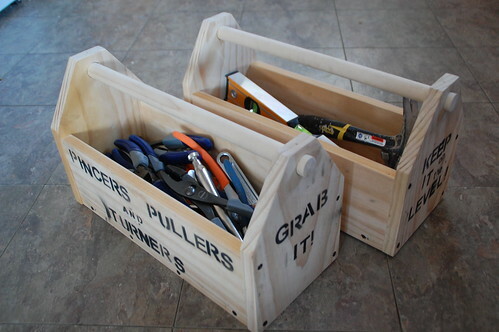 Great ideas for toolbox. I always face problem of finding a particular tool because I used to put all tools together. I like your idea.